Driving up a long, wooded path, glimpses of a serene lake peek through the trees. Situated above the lake, a winsome wood lodge with an expansive outdoor patio draws you farther through the woods. At the end of the path, the lodge greets you with lush landscaping and solid wood double doors with black rivet detailing and custom black iron handles. Taking your first steps into Ray and Diane Barrett’s lodge, you are overcome with a feeling of warmth and welcome, plus a killer view. Built on 100 acres just 40 minutes from their home in St. Louis, the Barrett’s lodge was developed with family in mind. “Ray and I wanted a place where we could gather with all of our children and grandchildren,” says Diane. And with 24 grandchildren between them, the lodge had to be durable. With the goal to create a relaxing, stress-free environment for family and friends to escape and get away, the Barretts enlisted Diane’s brother, builder Ron Emmenegger, president of Ronald E. Emmenegger Enterprises, Inc., to custom build their second home. Also on the Barretts' list of must haves for the lodge was an open concept and plenty of room for visitors. 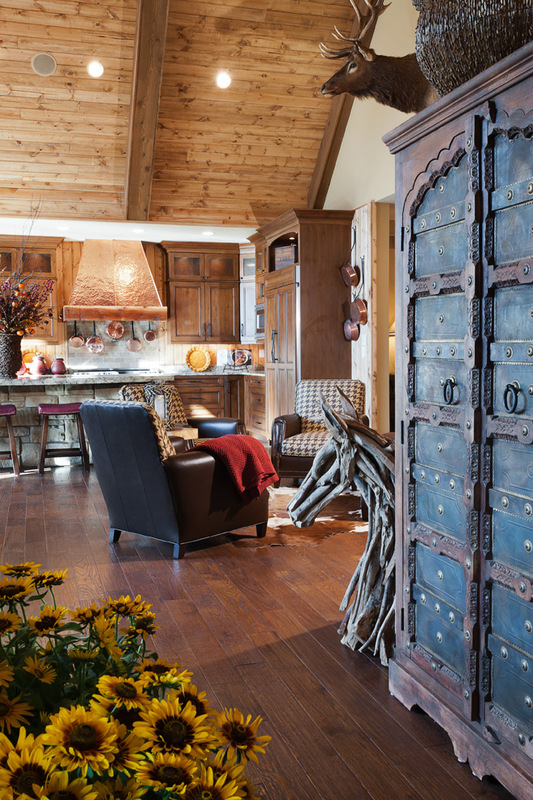 Completed in just seven months, The Lodge at Barrett Farms, as they call it, is the epitome of rustic elegance. Entering the home, 25-foot-wood-beamed ceilings keeps the room feeling open, yet warm. Ray and Diane utilized various wood types and colors, but kept everything warm, not too dark. Working with Ron, they were able to hand select each board before it was stained the appropriate color. “Ron works with you to make your home completely custom,” says Diane. “The quality of his work is incredible, and he is so accommodating and flexible,” adds Ray. A cozy seating area across from a walk-up bar provides additional seating when entertaining, which the Barretts do often. White and brown houndstooth chairs with leather back and nailhead detail are arranged in a circle creating a conversation area. The bar does not have a typical bar look and was designed to invite guests to walk up and make or get a drink whenever they wanted. Open shelves custom built by Ron display glasses, and horseshoe details, found throughout the entire lodge, add charm. 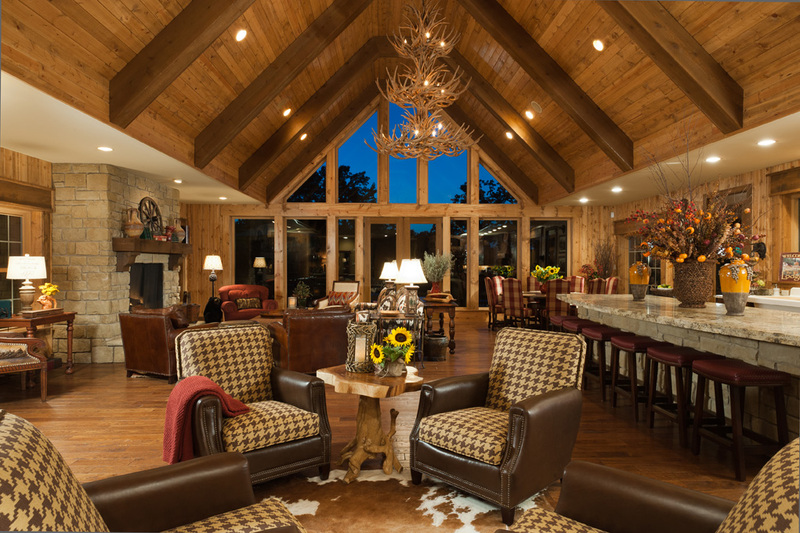 Between the bar area and the family room hangs a custom antler chandelier by CDN Antler Designs, Inc. The chandelier ties all three rooms together. A stone fireplace surround by Craftmasters, LLC is the focal point of the family room. 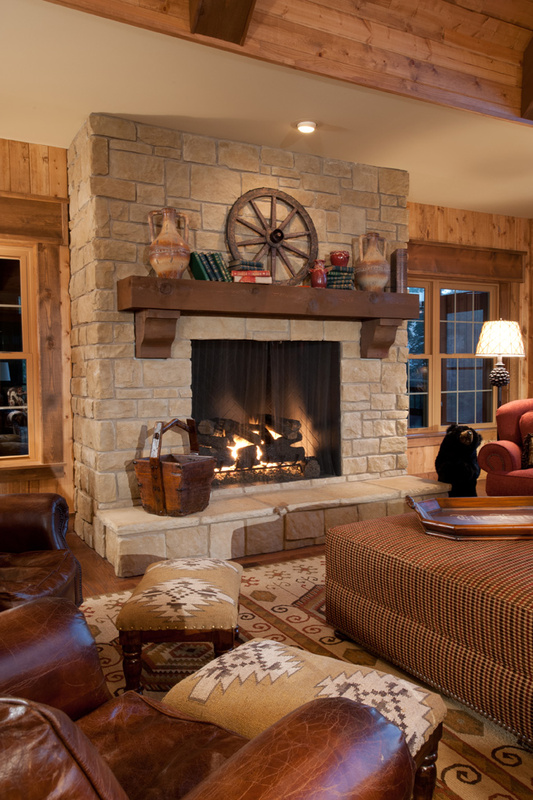 The family loves to cozy up around the fire on a cool fall evening or watch the snow fall during the winter months. A custom plaid ottoman from Diane Breckenridge Interiors sits atop an area rug from Rugs by Saga providing plenty of seating space in the central hub of the home. Antique details top the custom wood fireplace mantel. Diane began collecting accessories and furniture from antique stores as soon as the project got underway. “We wanted the pieces found to look like they’ve been here a million years,” she says. For a home in the country, the kitchen is fully equipped for city entertaining, complete with two dishwashers, four trash bins, warming ovens and more. A large golden beach granite island by Stone Fabricators functions as both a serving platform for food and drinks as well as extra seating. Knotty alder cabinets by Archway tie in with the wood ceiling and trim. The custom copper range hood by James Custom Sheet Metal, Inc. is a warm contrast from all of the wood in the space. The open multi-purpose space of the main room allows for family and friends to sit and hang out, eat or enjoy one of two outdoor porches. Large windows allow visitors to see from the family room to the porch and vice versa integrating the spaces so that no one feels disconnected from the party. 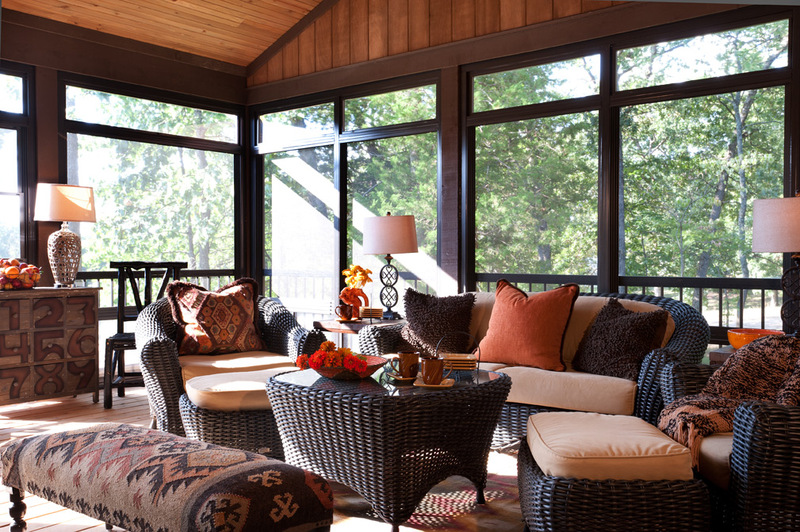 The all-season porches can be enjoyed in the summer or the winter thanks to screens installed by Broadview Screen. With a slew of visitors at any given time, it was important that the lodge have plenty of space for family and friends to spend the night. Three guest rooms down a side hallway each have their own unique personality as well as bathroom. 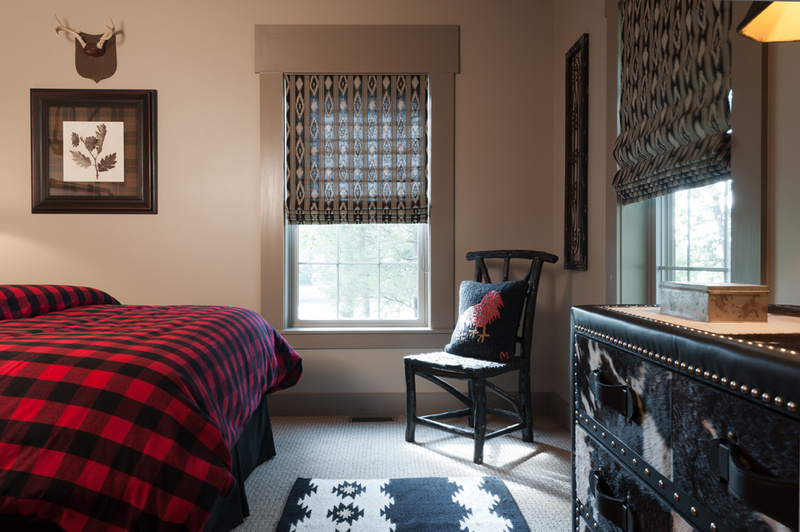 Each room theme was inspired by a fabric found by Diane and her staff. Heading down the long hallway, the first guest room you come to is classified as the deer room or red room. Rich red walls are adorned with antlers varying in shape and size. A red and cream deer fabric frocks the bed that is topped with a red double-door headboard available through Diane Breckenridge Interiors. 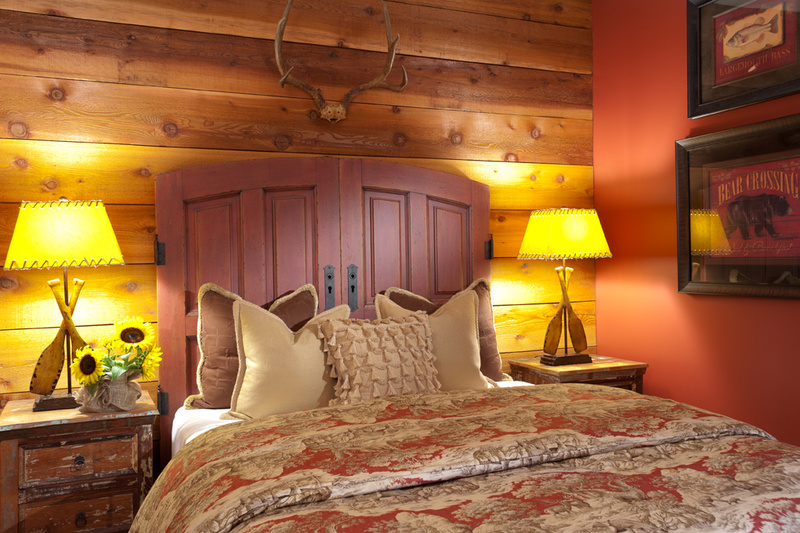 Behind the bed a cedar accent wall breaks up the red and matches the cedar trim on the doors and windows. 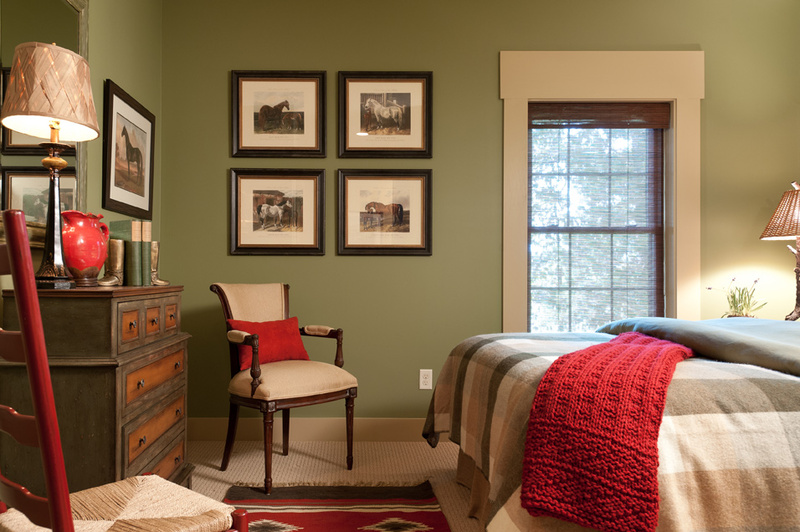 The next room over is fondly known as the horse room or green room. 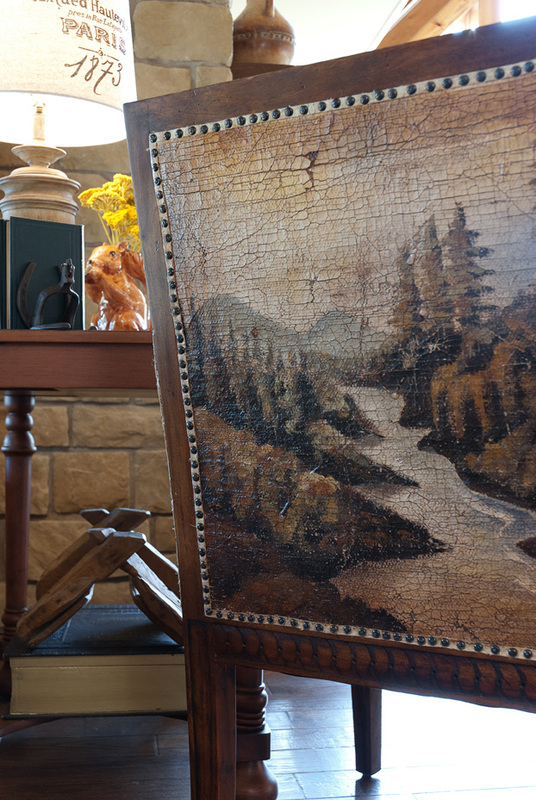 Diane found a blanket resembling one you would find under a horse saddle to start the inspiration for the room. The Barretts have always had racehorses and Ray’s granddaughter Lauren is a rider, so they knew horses would be the theme for one of their rooms. Red accents pop against the serene green walls. The room also has a nice view of the porch and lake. At the end of the hall is the gray room. The room has a cool color scheme and a traditional iron bed. A red and black buffalo check spread brings in color. A window was added to let in natural light. Down the opposite hallway is the master bedroom. The room was inspired by the custom bed by Flat Rock and the unusual fabric for the bedspread, which is a bright blend of pumpkin, yellow and turquoise. Instead of building a walk-in closet, custom built-in wall cabinets were constructed by Cheltenham Construction Services, Inc. The cheery pumpkin walls lighten the space as well as natural light from a window that was added to extend their view of the lake. Despite all of the original details throughout the home, the true star is the outdoor space. A deck spanning the back of the home allows outdoor seating for eating or relaxing and also has access to the yard and lake on both sides. As the sun begins to set, staring out across the lake with a glass of wine in hand is truly the best way to finish up a day at the lodge.